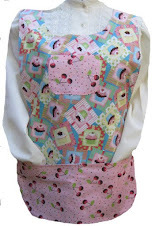 Cobbler aprons are made from pre-shrunk 100 percent cotton fabric. You get two aprons in one. Cobbler aprons fit waits up to 50 inches. There are two large pockets on each side of the cobbler apron. I thought that I would share a picture of the apron that I made for a theater production up in northern California. It really did turn out cute and worth the struggle that I had with the bodice. My son likes his hot chile peppers and especially hot sauce. The hotter the peppers are and the hotter the hot sauce is the better it is. My son has been growing chile peppers for several years now, and has recently grown Carribean Red Chili Peppers. The plant is producing large amounts of Carribean Red chile peppers, which makes him very happy. The Carribean Red Chile Red pepper 300,000 - 475,000 Scovilles. The Carribean red habanero is about twice as hot as a regular habanero. This extremely hot pepper, originally from the Yucatn peninsula in Mexico, is now also cultivated in the Carribean and around North America. Put all the ingredients in a blender or food processor; blend until smooth. You can preserve your sauce by canning it in sterilized pint jars in a hot water bath for 35 minutes. For serving, pour into saved and cleaned bottles with a sprinkler top. These are the same chili peppers that he used in a dish, that literally made me cough from breathing in the hot pepper smell. It is hard that when I need some ZZZzzz...every one around me is sound asleep. What do you do when you feel miserable to pass the time? No use in trying to go to sleep again for now. Maybe, the chance will come that I can finally get some shut-eye. I have finally met my match. Sometimes, I don't mind a challenge, but this time the vintage apron pattern won. Looks can be deceiving. Before taking on the project of making this vintage apron for a theater production, I thought no problem. I was wrong. I feel like I am just learning to sew again. So frustrating. The apron is now ready to be fitted, so now it is just waiting and seeing. The apron is not completely finished, but I will finish it after it is brought back from the fitting.